The application of workforce analytics has experienced a “stunning regression” since 2014, according to a recent report. This comes despite aggressive efforts by data experts and HCM consultants to inject the use of analytics into everything from candidate screening to engagement measurement and workforce planning. The 2018 Global Leadership Forecast—by the leadership development firm Development Dimensions International, the Conference Board and EYGM—found that the success rates of analytics projects declined in every area studied. Those included internal benchmarking, forecasting future talent needs and business-impact metrics, such as ROI. The numbers are worse when you look at emerging analytics, such as using what-if scenarios to forecast talent needs or employing data visualization—an often-mentioned hot new thing lately—with “storytelling” to present data analysis more effectively. Only 18 percent of the organizations studied succeeded in those areas, Sinar said. The report has an explanation about why the practical use of data in HR is proving to be so dismal, and it’s not about technology. “Our data shows that it’s likely a case of the analytics bar rising faster than HR can leap over it,” Sinar wrote. 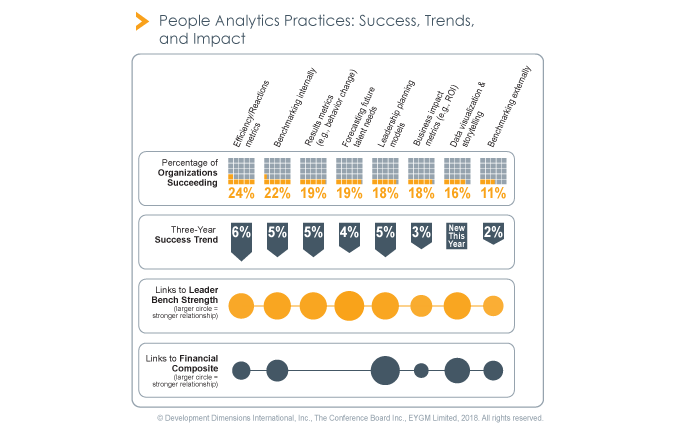 Seventy percent of HR professionals say they’ve increased their skills in analytics and data-driven decision-making. They’re just not increasing them fast enough. That makes perfect sense. Indeed, it seems to us that the biggest question is why would the report’s findings surprise anyone? Last year, we reported Mercer’s findings that 45 percent of C-level executives said HR didn’t provide them with actionable analytics, while 73 percent of HR leaders had plans to improve their capabilities in the area. The same report said only 17 percent of organizations planned to change the way they’re currently delivering HR services. It strikes us that the 2018 Global Leadership Forecast is simply demonstrating again that CEOs are either ignoring, or are oblivious to, the fact that HR can’t keep up with their evolving needs. One place to look for evidence of that is in corporate spending: While HR budgets as a share of total operating costs rose to a new high in 2017—3.1 percent compared to 1.6 percent in 2016, according to Bloomberg BNA—median funding increases for HR departments dropped to 3.7 percent from 4.2 percent in both 2015 and 2016. In addition, Bloomberg BNA said, the median amount allotted to HR in 2017 was $1,087 per employee, down from 2016’s $1,440. Another topic to examine is how much learning and development money is being spent on training HR professionals in at least some aspects of data analysis. Many, if not most, HR practitioners have backgrounds in areas such as organization, communications, administration and business, but few seem to have spent much time learning about data. That’s certainly changing: SHRM’s Competency Model says “proficiency in analyzing and interpreting data” is among the key factors for achieving success in its business-oriented proficiency cluster. Yet an informal poll of vendors and practitioners leads us to believe that HR isn’t being given the time or education it needs to put data to effective use. While we’ve heard some observers say that means more companies will dedicate data scientists to HR, we remain skeptical about that. According to PayScale, the median salary for a data scientist in New York City with five years of experience is about $96,000, and recruiters say there’s far less talent out there than is needed to meet the demand. It’s difficult for us to imagine employers spending that kind money on data scientist dedicated to HR when that same person could be used on product or strategic initiatives—the kind that are more easily tied to revenue. Vendors are certainly aware of the issue. Several of them, such as SAP SuccessFactors, offer programs to help HR acquire skills in areas such as enterprise analytics and reporting, as well as in using their own data tools. We’re not quite sure what to make of that, but it does make us wonder if employers themselves know what kind of people they need to get the most out of their workforce data.